This recipe took quite a bit of adapting. I was looking at a traditional recipe that had me frying the latkes in a pan and then I found this version which explained cooking them in the oven. If you’re not comfortable moving a baking pan of oil around them you can still make them in a pan (cast iron works best). Peel potatoes and grate coarsely. Place in a colander to drain. Chop onion into small pieces and add to colander. Mix potato & onion and press down in colander to remove excess moisture. Use paper towels on too and press hard 3 times. Let sit for a few minutes and repeat twice more. Preheat oven to 400F /205C. Put oil in pan (Make sure the pan has a good rim so the oil won’t splash over the edge when you move it or flip over the latkes.) Place pan in oven on centre rack to preheat. Meanwhile, put potato mixture in a large bowl. Mix together the dry ingredients and add gradually. Beat egg and stir in till well blended. Remove pan (carefully) from oven. Using a large spoon, place spoonfuls of mixture in the pan, making sure they are not touching each other or the edges of the pan. Flatten them slightly with the back of the spoon. 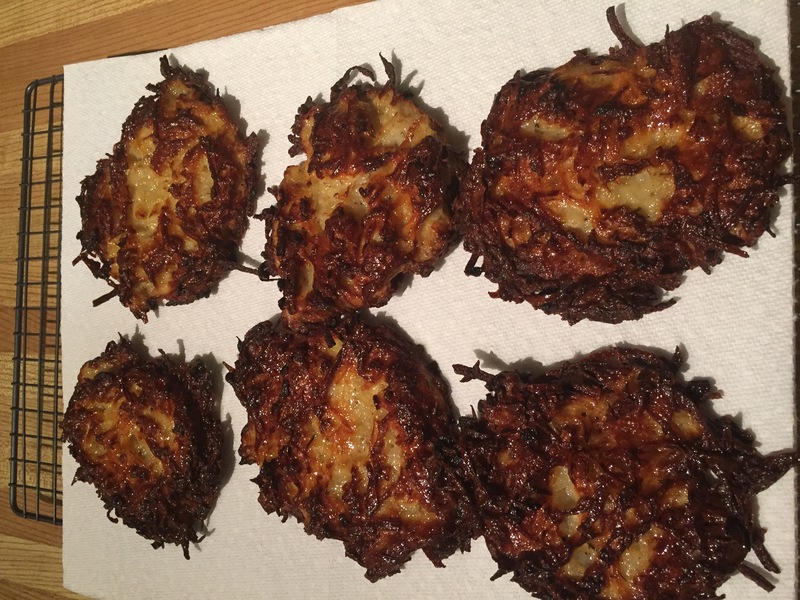 Place pan on centre rack and let cook for approximately 15 minutes or until latkes start to brown at the edges. Remove from oven and flip latkes slowly using 2 spatulas so they don’t go splat! Cook for another 10-15 minutes, or browning on the top. Remove and drain on paper towels placed on a wire rack.